The theme of the data challenge was to find novel and explicitly spatial insights on the Brexit. Our contribution relates the recent influx of foreign people to the Brexit voting outcomes. 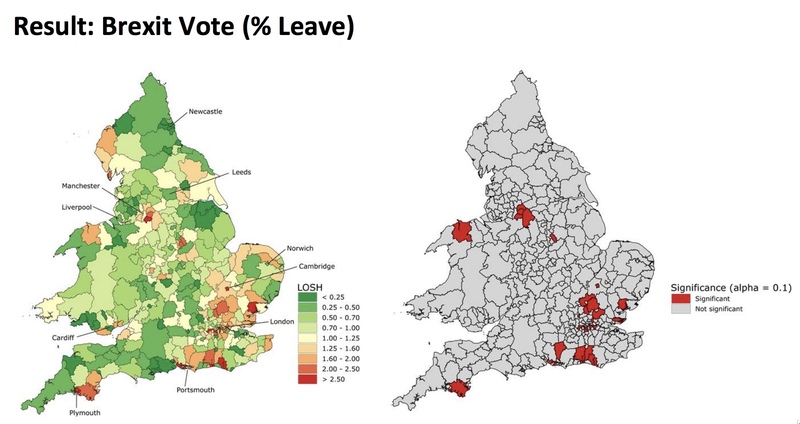 Thereby, we applied time series trend clustering to immigration data and estimated the local spatial diversity of the Brexit leave votes to capture local disagreement in the voting behaviour. Through testing different models, we could reveal that the exposure to recently arrived immigrants in nearby areas is significantly related to the percentages of leave voters. The best results were thereby achieved with geographically weighted regression models, which take account of the influx of immigrants in nearby areas. Significant variables include Black and Asian ethnicities. The results indicate that it might not be the general amount of foreign people in a region which is important to explaining the Brexit outcomes. Instead, recent spikes in immigration and thus timely exposure to not yet well integrated foreigners might be more important to peoples’ voting behaviour. The presentation delivered at the GISRUK conference is hosted by Konstantin Klemmer.